The software is with free updates of diagnostic functions and technical support. Přidána kontrola přepětí baterie před spojením. 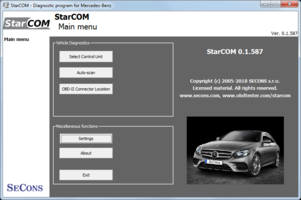 StarCOM is diagnostic tool for Mercedes-Benz and Smart vehicles. It supports all OBD2 compliant vehicles since 1996. Our OBD2 to USB diagnostic interface contains 10 multiplexed ISO9141 K-Lines, high-speed CAN-BUS and analog measurement circuits. Supported protocols include KWFB, KWP2000 (plain and gateway/D2B connection), KWPCAN, UDS. Please use our contact form if you wish to get more information about StarCOM. This page is under construction and product under development. Stay tuned.... Beta version should be available in 2018. Please use our contact form to get more information about StarCOM.